Another holiday season is up us! Here's a look at the biggest games of the season as we make our way to the end of 2016. You can find our other previews here. Pokémon games always drum up a good deal of excitement, but last summer's Pokémon GO phenomenon has done a lot to fuel anticipation for Pokémon Sun and Moon. That's because Pokémon GO introduced a whole new audience to the wild world of Pokémon, and while some people undoubtedly deleted the app after wondering what the fuss is about, there are certainly new Mareeps in the flock (welcome!). Pokémon Sun and Moon has also caught a lot of eyeballs because of the hype behind classic Pokémon boasting new "Alolan forms." And as the lovably ridiculous Alolan Exeggutor and Alolan Rattata demonstrate, these tropical Pokémon are no mere palette swaps. Pokémon Sun and Moon are the seventh generation of the mainline Pokémon games. This time you're tasked with catching 'em all in beautiful Alola, an island that emulates Hawaii with its climate, its culture, and even its biodiversity. 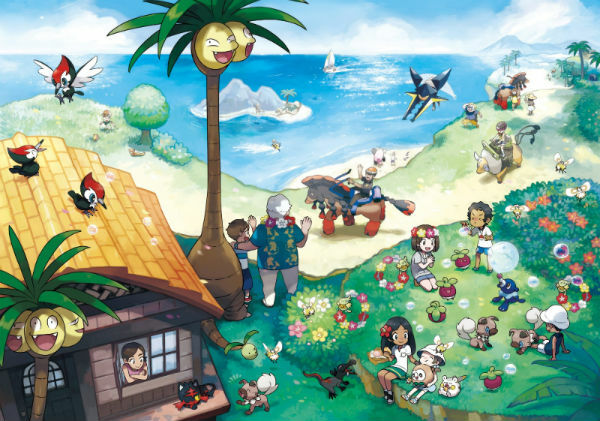 Pokémon Sun and Moon are getting a worldwide release for the Nintendo 3DS on November 18 – around the time of year most North Americans start dreaming of tropical getaways. Like Pokémon X and Y and Pokémon Omega Ruby and Alpha Sapphire, Pokémon Sun and Moon are 3D adventures with fully-animated battles. As a whole, it doesn't seem like Sun and Moon make any wild changes to the basic Pokémon formula: You catch Pokémon, you unleash them on opponents (both live and programmed), and you fill out your PokéDex while you learn more about your surroundings and the people living there. There's even a team of goons that are up to no good. In this instance, Team Skull will presumably stymie your attempts to celebrate love and friendship through Pokémon. Regardless of the similarities between Pokémon Sun and Moon and its predecessors going back to the very first Red and Blue, this Alolan adventure appears to be changing up its single-player campaign a bit. For one thing, Gyms and Gym leaders are replaced by islands and Trial Captains who expect you to earn your badge by surmounting challenges and tasks. Is it an annual franchise? Though it's not uncommon for at least one Pokémon spin-off to come into being every year (Pokémon GO being a perfect example), mainline Pokémon games are a rarer breed. Our last full-fledged Pokémon adventure was 2014's Omega Ruby and Alpha Sapphire for the Nintendo 3DS, and even those were remakes. We haven't seen an entirely new mainline Pokémon game since 2013's Pokemon X and Y.
Kat and I are USGamer's Pokémon masters, and I think it's safe to say we're both pretty excited for Pokémon Sun and Moon (feel free to lob a Master Ball at my head if I'm wrong about this one, Kat). Granted, we were both a little apathetic towards the new game at first, but I gradually found myself warming to the game with each new reveal and each new bite of information about Alola. The Alolan forms really spark new life into some of my old favorites. 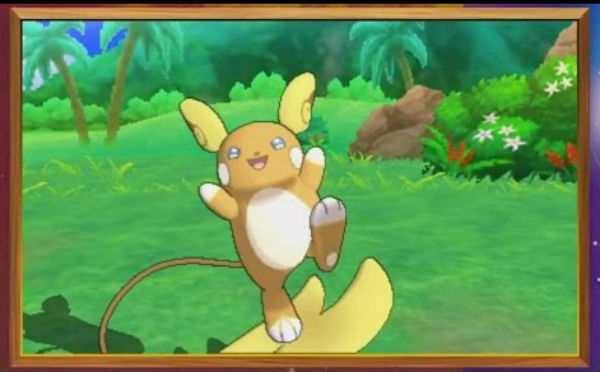 I mean, Alolan Raichu has a surfer's tan, and it uses its own tail as a board. Come on! I also love the idea of Pokémon Moon being 12 hours ahead of Sun (or vice-versa?). I'm a hopeless nighthawk, so while all you godless worshippers of the Day-Star frolic under Sol's burning eye, I'll be gallivanting in the cool darkness with Lunala. And then I'll probably screw with my 3DS's clock to make sure the night goes on forever, because man, to hell with the sun. Oh, and finally: Pokémon Sun and Moon lets you take pictures of Pokémon and share them. There you go, Nintendo. A Pokémon Snap follow-up. It took 17 years, but you did it. Applause. If you'd like to learn more about Pokémon Sun and Moon but you lack the funds and /or grades to get into Pokémon U, why not read some of our articles about the games? Nintendo's short presentation coveres new Pokémon, old Pokémon, and quietly reaches out to Chinese players. Get ready to make thousands of new friends! How Exactly are Pokémon Red and Blue and Yellow Going to be Compatible with Sun and Moon? Game Freak has some interesting technical hurdles to overcome in making Pokémon Red, Blue, and Yellow compatible with the newly-announced Sun and Moon. A fire cat! A clown seal! An owl with a leaf for a bow tie! The new Legend of Zelda is still Nintendo's main course at E3 2016, but Pokémon, Dragon Quest, and other Nintendo 3DS games are side-dishes. But not for the reason you might expect. Make pals with the new Pokémon and ponder if Hyper Training will change the competitive battling scene. Trial Captains and challenges replaces the basic Gym system, as Sun and Moon show off more new Pokémon. None of the new features compare to a Raticate living the good life. Alola, Yungoos, and Dark-Type Rattatas: A tale of fragile ecosystems that's based on the real world. Tagged with Game Freak,	Nintendo 3DS,	Pokemon,	Pokemon Moon,	Pokemon Sun,	Previews,	The Pokemon Company.